So I know it’s been awhile since I’ve done an updated post on what the Teeny Tot has been up to. So I thought I’d put one up for you all today. 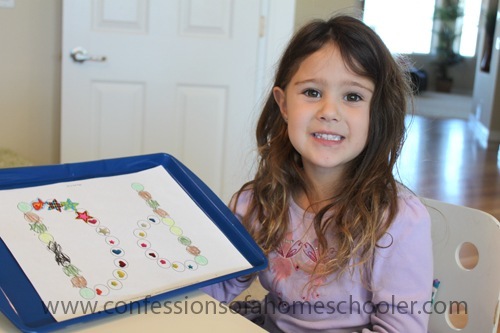 She’s going through my Letter of the Week program, but she’s really ready for more now and so I’m throwing in more of my K4 Kindergarten activities to challenge her a bit more. She still likes the fun Letter of the Week preschool games so I still let her do those for fun as well. 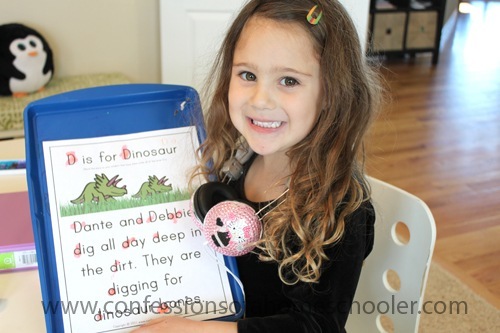 I usually still pull out similar Letter of the Week letter activities for her, so this week she’s going back through the letter D.
The D is for Dinosaur letter hunt is from my Kindergarten Curriculum. 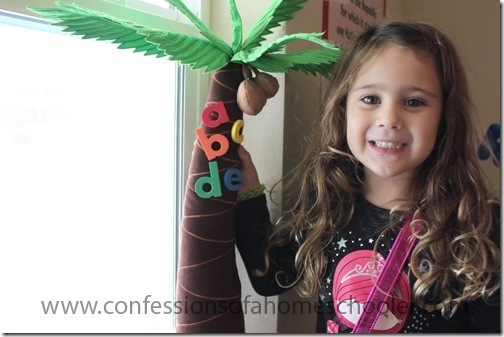 She has to locate and mark all of the upper and lowercase letter “Ds”. She normally uses a highlighter, or a do-a-dot marker. But you can also have them put stickers on the letters, circle them, or whatever works best for you. You can also click here to download the Kindergarten Letter Hunt worksheets free on my site. She loves the pre-writing worksheets from the Letter of the Week so she pulled these out today. They’re still great for working on fine-motor skills, but I’m also making her start doing my A-Z Handwriting worksheets as well. 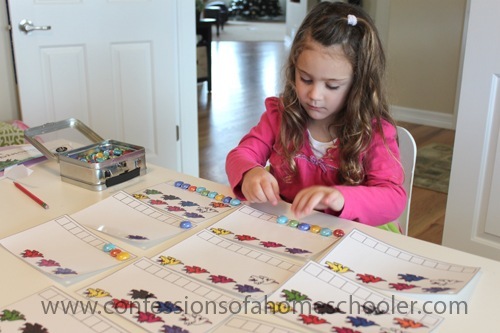 The Teeny Tot loves anything that is more hands on, so today she’s counting using Learning Resources Math Links. 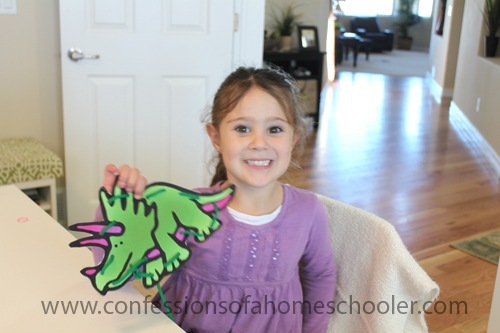 So for each number on her dinosaurs she’ll link that many math links then hook them to the dinosaur. I just punched a hole in each dino card. The lacing activity is also one of her favorites, so she requested to do this one today. Like I said, she’s a pro, so we I try to have her do new stitching patterns to make it a little more challenging now. For her letter d do-a-dot worksheet, she used stickers today instead of the do-a-dot markers that she normally uses. 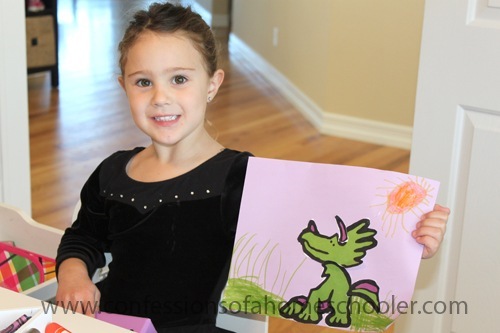 And of course she loves coloring and asks to do this almost daily. This worksheet is from the Letter of the Week curriculum. 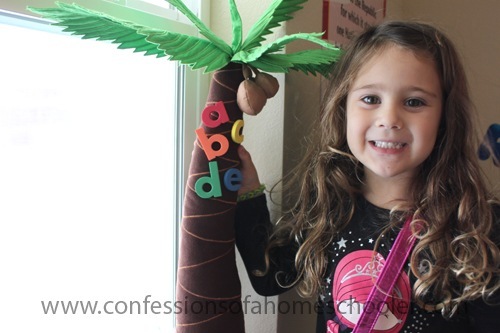 Of course we’re still adding our letters to our palm tree, we’re just moving through them at a faster rate than once per week now. I wanted to review all of her letters and sounds before we move into reading. 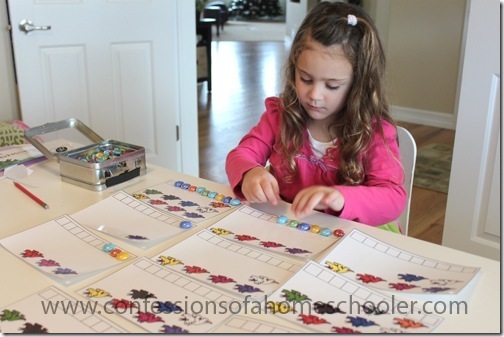 Here is our counting worksheet. 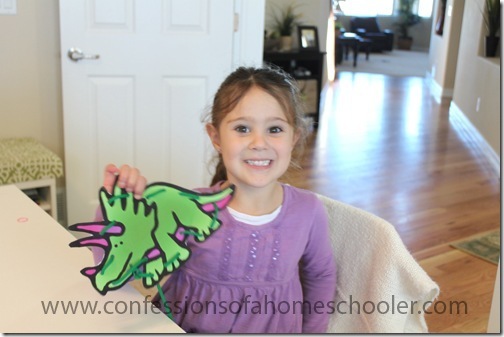 She’s counting the dino’s on each card, then placing the correct number card on them. 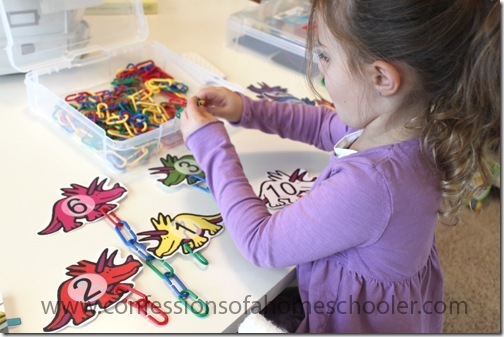 The letter matching activity is great for reviewing letter recognition. We say each one after she matches them all to the card. Then for an added challenge she matches the lowercase disks to the uppercase card. And another great counting and one-to-one correspondence worksheet is the graphing cards from my preschool curriculum. The Teeny Tot is using glass beads to count the dinosaurs, but you can use whatever you want to as long as it fits in the little square on the cards. 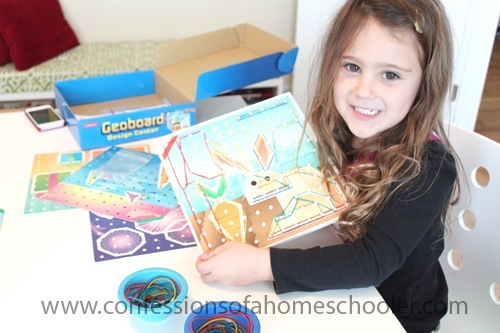 Another fun addition is our Lakeshore Learning Geoboard Design Center. All of the kiddos love this game even though it’s really meant for prek – 3rd grade. It’s still fun for all! These activities are a combination of my Letter of the Week preschool and K4 Kindergarten curriculum. For more information click the below images! I always love what you put together for the kids! Kudos! I have a question…do you ever have jealousy from an older one that they want the younger’s activity? 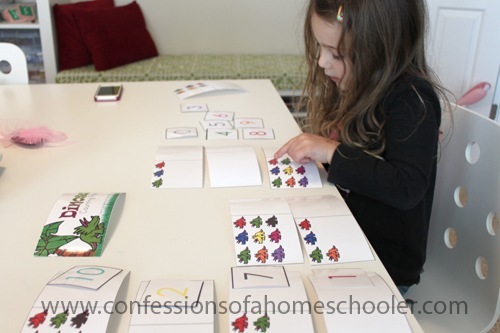 My oldest in 1st grade sometimes gets huffy that his math time is not the toddler’s memory game and I don’t know why he feels that way. I give them all as much individual attention as I can, but I still have days where they want each other’s (usually easier) stuff! I just have to say, her hair is beautiful! I know that has nothing to do with the post whatsoever, but those curls are just gorgeous! Okay – now on to the post, I love it! 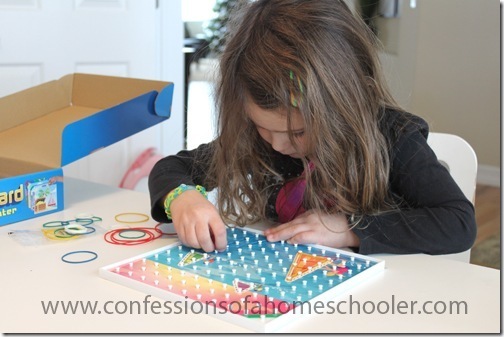 We use Montessori at home for the most part, but these things are so fun, and I know my 4 (almost 5) year old would love them. I may invest in your curriculum for some added fun here and there! 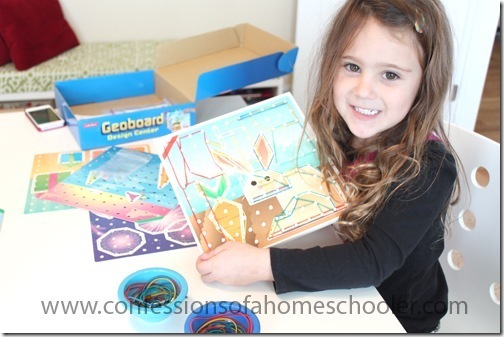 Thanks for the link to the letter hunt worksheets – they will be greatly enjoyed! I love your new palm tree! Did you make it or did you find that somewhere? We bought it, I only wish I was that creative! 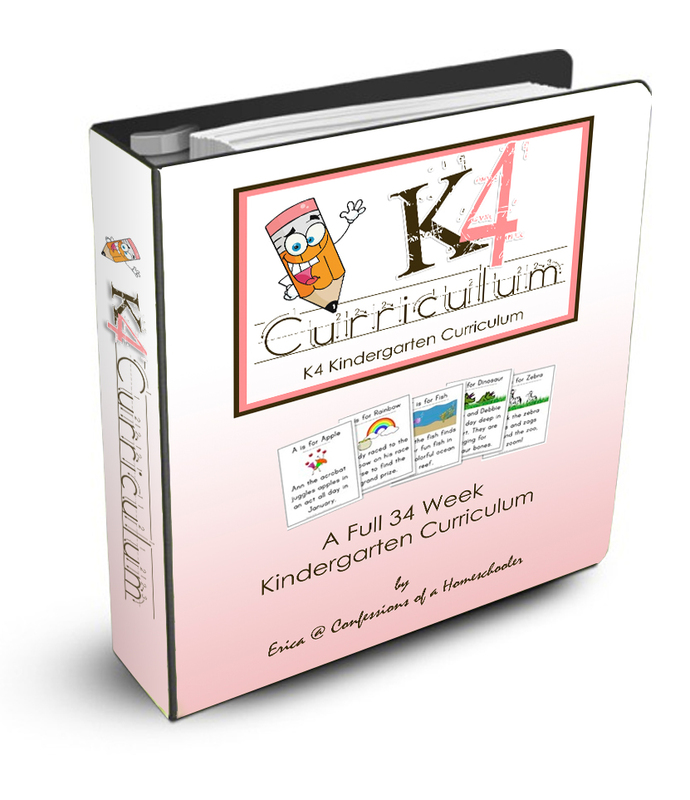 I really like your prek and k4 curriculums and I was wondering if your k4 curriculum would be considered the same as a VPK level? 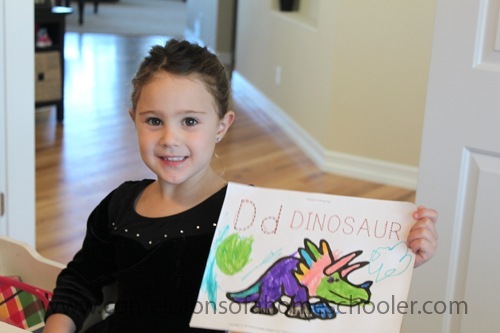 Still requiring a kindergarten (k5) the next year? I love your blog! I think it’s awesome how you create your own curriculum! That seems more effective and a lot cheaper than workbooks! 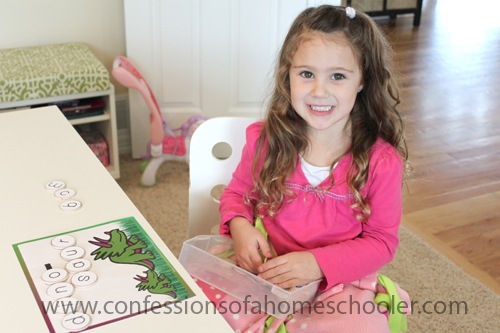 I also homeschool my 3 littles. Thanks for sharing! When she moves into Kindergarten next year, what are you planning to use? Or is this K4 curriculum her kinder year? Technically she’s too young to go to 1st grade because of where her birthday is. So we did K4 this year, but we will probably do something like Abeka kindergarten and Math U See primer for next year just because I don’t want to push her ahead a grade. But yes, K4 would have normally been her kindergarten year.